FLORIDA: Bill Nelson Concedes After Final Recount - Joe.My.God. 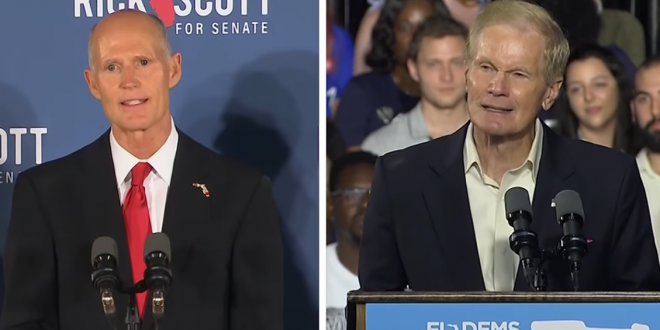 Official results posted by the state on Sunday showed Scott ahead of Nelson following legally required hand and machine recounts. State officials will certify the final totals Tuesday. The results show that Scott is poised to end Nelson’s lengthy political career. Democrat Nikki Fried hung on through the recount process to defeat Republican Matt Caldwell in the agriculture commission race by 6,753 votes out of more than 8 million cast. She will replace Nelson as the only Democrat holding statewide office in Florida. Republican former congressman Ron DeSantis will be the state’s next governor after Democratic Tallahassee Mayor Andrew Gillum conceded Friday afternoon. A machine recount that ended Thursday showing DeSantis with a 32,463 vote lead.